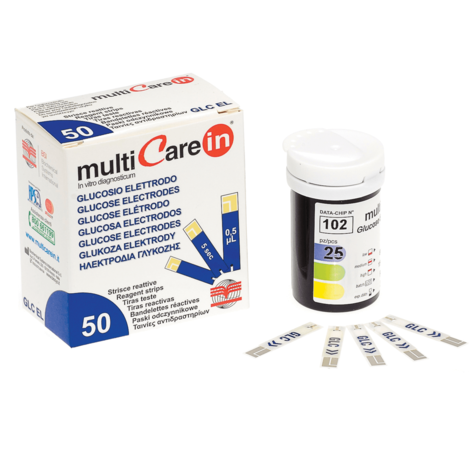 The MultiCare-In glucose reagent strips kit contains 50 glucose reagent strips, the instruction sheet and the data-chip for the multiCare-In multiparameter diagnostic device.Using the multiCare In glucose reagent strips with the multiCare-In multiparameter diagnostic device, it is possible to quickly check the glucose levels in the blood or monitor the trend. The level of glucose in the blood is influenced by the diet, but also by: medicines, diabetes mellitus, pregnancy and severe illnesses. 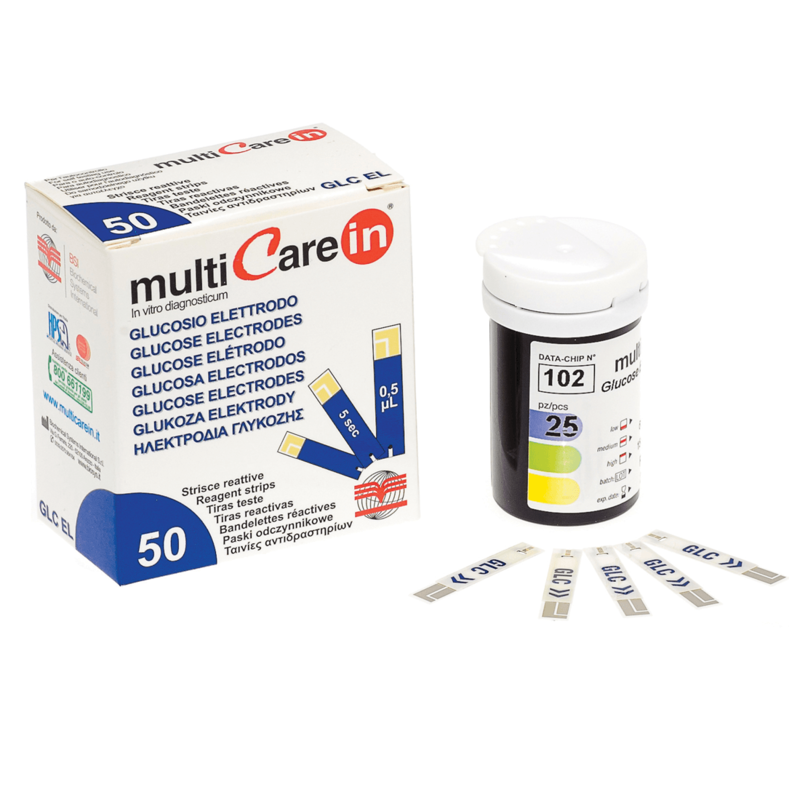 It is recommended to check blood glucose concentration on all people who are used to smoke, to drink too much alcohol and to eat fat and are over weighted or do not exercise enough.The measuring range is: 0.6 - 33.3 mmol/L (10 – 600 mg/dL).multiCare-In multiparameter diagnostic device has been developed to execute several determinations from fingertip simply by changing strip. multiCare-In multiparameter diagnostic device gives the possibility to check and monitor the PERSONAL CARDIOVASCULAR RISK using just one easy to use and to carry system. In fact multiCare-In multiparameter diagnostic device is a new system dedicated to check and monitor the GLUCOSE, CHOLESTEROL and TRIGLYCERIDES concentration in the blood. The multiCare-In multiparameter diagnostic device provides reliable results in about 30 seconds. Buy with Confidence from a MultiCare In Authorised Dealer and All Purchases come with a VAT Receipt.